of Avi Pearce at the HMMA. MEMORIES and * OUR HEROES. Avi Pearce also appearances on Rogers CB.T.V 10. Thehazefm Radio Broadcaster "Musically Yours"
by Deirdre Malllehe in the interview of Avi Pearce. Interview of Recording Artist "Avi Pearce"
ThatChanel.com on the "Liquid Lunch Show. and the rest of the News Team. of Universal Aftershock Haiti 2010. We just wanted to let you know that the event you submitted to SNAP North Mississauga has been published! You can view and share the photos online here: http://snapd.at/ee6xzr. Mississauga residents were making a difference recently as they came out for the "Universal Aftershock" Benefit Concert featuring singer/songwriter, Avi Pearce. While fans and supporters enjoyed Avi's unique pop fusion sounds throughout the concert, proceeds from the event also went towards the Canadian Red Cross in order to help re-build the lives of people in Haiti after the recent earthquake. The Meadowvale Theatre was filled with hope throughout the afternoon, and even a few laughs as comedian Jason Blanchard entertained the crowd as the show's Master of Ceremonies. Check out Avi's music at www.myspace.com/avipearce or find out how you can help in the Haiti relief effort at www.redcross.ca. Share this photo on Facebook. E-MailLog in to email photos. 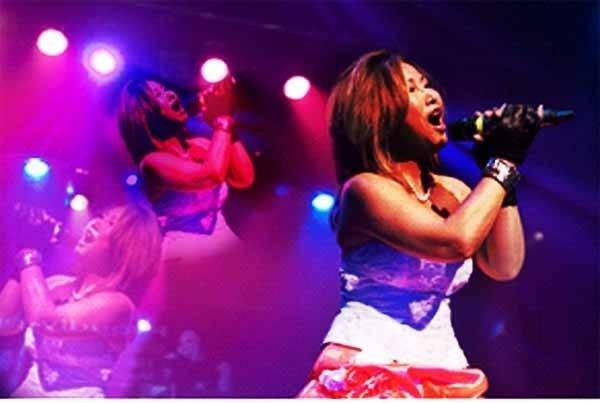 Singer Avi Pearce dazzled her fans at Meadowvale Theatre yesterday with an afternoon of world pop hits as she presented her Universal Aftershock concert for Haiti relief. All proceeds are going to Canadian Red Cross Haiti relief initiatives. “Haiti means the world. If you can help one person at a time, it gives you the chance to do something right and that’s what I'm trying to do,” Pearce said before she ventured on-stage. The former Erin Mills resident, who now lives in Ajax, was thrilled to come home and perform at the Meadowvale Theatre. Red Cross volunteer Nancy Alderdice was on hand to collect donations and answer questions about Haiti. “There are still people in Haiti using tents made out of bed sheets and garbage bags," said Alderdice. "Every dollar goes a long way ... 25 cents can provide a kid with a meal. It doesn’t take a lot to do a lot." Master of ceremonies Jason Blanchard opened the fundraising concert by reminding the audience that everyday needs like clean drinking water are still a concern for Haitians. Then Pearce took to the stage with two drummers and a trumpet player to perform You Are The World, a single she wrote for the benefit. She glided elegantly across the stage clad in pearls and a pink and white formal gown, while facts about Haiti were flashed against the stage backdrop. Pearce went on to perform her hits I’m Your Lady, Memories, Love’s Fantasy and Dreams, three tracks nominated for honours at the 2009 Hollywood Media Music Awards. The audience was also treated to the Mistletoe, her upcoming single that will be released in November. Meanwhile, fans were impressed with the way Pearce used her musical talent to bring awareness to the cause. “It’s a great idea for Avi to do this (benefit concert). Her musical career seems to be taking off quite well,” said fan Olwen Hyross. Pearce is hoping to take the Universal Aftershock performance on tour across Ontario. to host a benefit concert. in support of earthquake relief efforts in Haiti. Show time is at 3 p.m. Tickets cost $40. and courage of the people of Haiti. "I want to use my music and use my talent to help others,"
said Pearce, who plans to take the Universal Aftershock benefit concert on the road to other Ontario cities and, eventually, across Canada. earthquake hit in January they had little chance of rebuilding their lives without help from other countries. to help those who are struggling in Haiti. The concert will feature songs from Pearce's most recent album, Circle of Lives. She'll also debut a new song, Be The Change Aka You are the World. “Everyone will have a great time and when we unite for a very worthwhile cause we can all make a huge difference to the lives of the people of Haiti,” she said. All proceeds go to Canadian Red Cross. If you'd like to review the actual article, please copy and paste the code below. Streetsville and Meadowvale. It's on the front. SCHEDULED FOR AUGUST 15 AT 3:00 P.M. IN THE MEADOWVALE THEATRE, IN MISSISSAUGA. Avi Pearce is focusing on helping the world, one concert at a time. of Haiti rebuild their lives following the devastating earthquake. it’s time to take action now for long term support. This benefit concert will be held on August 15 at 3:00 p.m.
at the Meadowvale Theatre, 6351 Montevideo Rd., in Mississauga. as her birth place is Viet Nam. she now resides in the Eastern area of Toronto. on the road, throughout Ontario and eventually, clear across Canada. for a Hollywood Media Music Award. As well this song was recognized by Billboard Music. were nominated for Hollywood Media Music Awards. in April of 2011, her new CD will be released. will be released in November of this year. and to build a strong fan base. to support this exciting, high energy benefit concert. on August 15 from 11:00 a.m. This song is the heart of her new album "Moonlight"